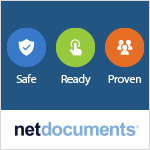 We have a joint challenge; pushing the technology boundaries of what we can do as well as what our supplier partners like NetDocuments and Microsoft can do. How can we bring our law firm partners into the fold and make them a part of our cloud journey? We are on the frontlines and have the luxury of getting feedback and insight from literally 1000s of law firms and IT leaders. As a result, we should be able to package this knowledge and deliver it to our clients in a way that benefits their own cloud journey. We believe that cloud infrastructure and related technology still has some growth ahead before we reach the point where cloud solutions can deliver 100% of what is required. At the moment, specific suppliers dictate which features/functions are supported in the cloud so firms must decide between maximizing functionality by minimizing the number of platforms on which a specific application will operate versus looking at the lowest common functional denominator that will enable you to maximize the number of platforms you can support. As a specific example Microsoft Word for Office 365 supports different functionality on the desktop, “online” and on a tablet. As a result if you want to work on a document on all three devices you are limited by the functionality available across all these platforms. This is a specific Microsoft example but it is not just a Microsoft or Tikit or NetDocuments problem, it’s more of an ecosystem challenge. With that being said, cloud first is not client-led at this stage. When firms tell us they want to be Office 365 compliant, ‘cloud ready’ or pursue a ‘cloud first’ strategy, people like me first ask “what do you mean by that?” In reality, we are still in the fact finding/definition phase and every firm I visit might have a slightly different cloud vision based on internal requirements, existing technology and user expectations. It’s up to people like us to be able to imagine and forecast where the agility requirements for an attorney will be in one to five years time and recognize that maybe the technology they need is not currently there but will be developed in the future. I will make the assertion that firm CIOs who know exactly what they want and tell you with a 100% certainty how to execute their technology strategy, will be challenged to adopt a true cloud first strategy in the short term because the technology does not necessarily exist to deliver all of the firm’s “I wants” or “must haves”. Alternatively, if firms in partnership with their suppliers and other strategic partners are willing to accept compromises as it relates to delivery than a true cloud first reality is more likely. In a sense, we are backtracking on the old adage of ‘making technology work for you’ and ‘the way you work’ and asking firms to be flexible when it comes to their existing way of doing things. Firms who are open to bending their processes to what technology allows them to do rather than forcing technology around what they want to do are in a good position to pursue a cloud first vision. Again, it goes back to "we are in this together” and the willingness to compromise. We have had client projects where specific firm professionals were unwilling to compromise and in a cloud first environment this is not an option. Compromise is the cost of agility. If you want to go cloud you have to accept compromise. It presents an opportunity to perhaps revisit what you have done in the past and see how you might be able to streamline or change certain processes or requirements. Cloud is a completely new infrastructure which goes far beyond hosting offsite servers. It comes with changes in working practices, thought processes and new best practices. Microsoft Office 365 is a prime example of a cloud nirvana with a less utopian reality, at least currently. I see Office 365 presenting the biggest IT challenges in part because similar to defining cloud first, most law firms we talk to are still confused about what it is and what it isn’t. 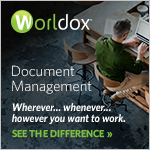 I recently hosted an ILTA webinar on the topic and discussed not only definitions and basic deployment options but mentioned what I call the ‘Office 365 Paradox’. If the firm wants to be a 100% Office 365 compatible, they cannot have any client side code. Most of the add-in code you use in Office, however, cannot be installed server side and is therefore not Office 365 compatible. Firms cannot simply retrofit cloud functionality, so compromise when it comes to add-ons, customizations and so forth should be re-evaluated. Also, challenge your turnkey suppliers to engage in the Office 365 conversation. What is their strategy? How are they working with cloud providers and how will you benefit?